This article is about the area in Wales. For other uses, see Gwynedd (disambiguation). Gwynedd is a large area in North West Wales. It has a long coast-lime with many cliffs and beaches. It also has many mountains including Snowdon, the highest mountain in England and Wales. Large towns include Bangor and Caernarfon. 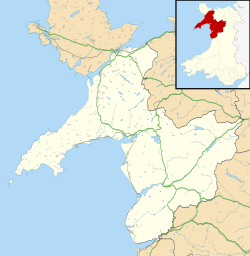 The county was divided into five districts: Aberconwy, Arfon, Dwyfor, Meirionnydd and Anglesey. This page was last changed on 25 January 2019, at 14:58.